Below you can find the latest Profession changes in the beta. [Socket Bracer] - Permanently add a socket to your bracers. Requires a level 60 or higher item. [Socket Gloves] - Permanently add a socket to your gloves. Requires a level 60 or higher item. 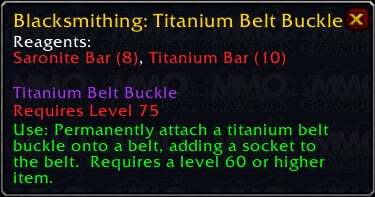 There is a new item called Titanium Belt Buckle. You will be able to socket your belt with this. [Delicious Roasted Boar] - Creates a delicious roast boar platter for you and your friends to enjoy. Scrapbot - Creates a mechanical vendor that buys anything. The scrapbot leaves after 5 min. Nitro Boosts - Permanently attaches overpowered nitro boosts to a pair of boots, allowing a skilled engineer to greatly increase run speed for until cancelled. The nitro boosts can only be activated every 5 minutes. Gnomish Lightning Generator - Generates a bolt of lightning to strike an enemy for 2250 to 2750 Nature damage. This entire device is made of metal, and the bolt occasionally hits you. Belt-Clipped Spynoculars - Permanently attaches a pair of spynoculars to your belt, allowing you to see far away. Only a skilled engineer can use the spynoculars. Flexweave Underlay - Permanently attaches a flexweave underlay to a cloak, allowing a skilled engineer to turn the cloak into a parachute to fall slowly for 10 sec. The cloak can only be used every 5 minutes. Heartseeker Scope - Attaches a permanent scope to a bow or gun that increases its ranged critical strike rating by 40. Micro Stabilizer - Attaches a permanent micro stabilizer to a bow or gun that increases your ranged hit rating by 40. Hyperspeed Accelerators - Permanently attaches hyperspeed accelerators to a pair of gloves, allowing a skilled engineer to increase their haste rating by 340 for 8 sec. The gloves can only be activated every few minutes. Personal Electromagnetic Pulse Generator - Permanently attaches a high-powered device to your belt, allowing you to stun nearby mechanicals. Only a skilled engineer can activate the modified belt. Saronite Grenade (45 yd range, instant) - Inflicts 540 to 900 Fire damage and incapacitates targets for 3 sec in a 3 yard radius. Any damage will break the effect. Unreliable against targets higher than level 90. Saronite Bomb (45 yd range, instant) - Inflicts 1125 to 1875 Fire damage and medium siege damage in a 10 yard radius. Lightweave Embroidery - Embroiders a subtle pattern of light into your cloak, giving you a chance to cause an additional 800 to 1000 Holy damage when you damage an enemy with a spell. You can only embroider your own cloak and embroidering your cloak will cause it to become soulbound. Darkglow Embroidery - Embroiders a magical pattern into your cloak, giving you a chance to restore 300 mana when you cast a spell. You can only embroider your own cloak and embroidering your cloak will cause it to become soulbound. Swordguard Embroidery - Embroiders a magical pattern into your cloak, causing your damaging melee attacks to sometimes ignore 1000 of your target's armor. You can only embroider your own cloak and embroidering your cloak will cause it to become soulbound. Brilliant Spellthread - Permanently embroiders spellthread into pants, increasing spell power by 50 and Spirit by 20. Azure Spellthread - Permanently embroiders spellthread into pants, increasing spell power by 35 and Stamina by 20. Shining Spellthread - Permanently embroiders spellthread into pants, increasing spell power by 35 and Spirit by 12.